A long time ago, in a strange decade called the seventies, a little movie came along that changed everything. Ever since, we’ve been singing the praises of Luke, Leia, Han, Chewie and so many more great characters from the awesome Star Wars universe. We reveled in the original trilogy, tolerated the prequels and soaked in all of the expanded universe stories we could get our hands on. Now we’re going to get three more epic feature films, with the first one set to come out on the eighteenth day of this very month! If that doesn’t psych you up, then check your pulse. Based on all of the Star Wars rumors that have been floating around the Internet these days, it’s safe to say that a lot of people are chomping at the bit to see “The Force Awakens.” We are too, so we thought we’d get in on the fun by giving our take on some of the facts and theories that are floating around cyber space. Remember, many of these factoids are pure fan speculation and may or may not be true. It’s just a lot of fun to speculate. So if you don’t like to be exposed to even the remote possibility of spoilers, you might want to stop reading now. When it first was revealed that the new Star Wars movie would feature some of its original stars, we have to admit we were a little skeptical. Who wants to see old man Harrison Ford and grandma Carrie Fisher try to pick up right where the original movies left off thirty years ago? Well, fortunately, that’s not what they’re doing. Instead, it has been reported that “The Force Awakens” is set thirty years after the events of “Return of the Jedi.” So, thankfully, the advanced age of Han, Luke and Leia will make sense in the context of the movie. And, based on the trailer, it looks like Harrison Ford does a great job of interacting with the new younger cast members, Daisy Ridley and John Boyega. IS DARTH VADER COMING BACK FROM THE DEAD? One of the most iconic moments in the latest trailer has to be the image of the burnt Darth Vader helmet. Surely the legendary villain will have an impact on this movie in some form, but what if that form is alive and in the flesh? Okay, we all know that Vader died in “Return of the Jedi.” We saw his funeral for crying out loud! But never underestimate the power of movie magic. Good ole Darth could show up in a flashback or perhaps in hologram form. Or maybe, just maybe, he pulled off one of the greatest death fakes in cinema history. I wouldn’t put it past the master Sith Lord. Now before you go calling us crazy, it has been reported that Hayden Christensen might actually be returning as Vader. We would certainly welcome seeing one of the greatest movie villains in history on the big screen again, even if he’s played by Hayden Christensen. HAS LUKE JOINED THE DARK SIDE? Where the heck is Luke?! That’s what we’ve all been asking for the longest time now. He’s not in the trailers. He’s not on the movie posters. Where in the universe is he? Harrison Ford, in a recent interview, said that there’s a “very good reason” Luke wasn’t in the trailer, which makes us think that, perhaps, our beloved Luke has gone to the Dark Side. Think about it. They must have a pretty big surprise in store for us if they’re holding their cards so close to the chest on Luke. And what would be more surprising than finding out that Luke has taken an evil turn? There’s even a theory out there that Luke is Kylo Ren! While we understand why this surprising turn would be upsetting to many Star Wars fans, we still think it would be a pretty cool and ambitious move for the filmmakers to make. Perhaps this new trilogy could be Luke’s redemption story, just like the original trilogy brought about his father’s redemption. SO WHO’S RELATED TO WHOM NOW? We find the number of family theories out there right now to be kind of hilarious. What we mean by “family theories” is theories about two or more characters being related to each other. Some think Rey and Kylo Ren might be related. Others think that Finn is Han Solo’s son. A few are of the opinion that Kylo Ren is a descendent of Emperor Palpatine. These are just some of the many family theories that are rapidly populating Internet message boards these days. Personally, we kind of hope that all of these theories are true because we have our own theory: they’re all related! What if all of Star Wars is just one big story of the most messed up family tree in history? We all freaked out when we realized that Luke kissed his sister Leia; yet, just imagine how much more we’d freak out if we found out that Han and Leia are also bro and sis. We’re joking of course. For Han and Leia’s sake we hope that’s not the case. Nevertheless, chances are with Star Wars, there’s going to be at least one family bombshell in this movie. So we’ve seen Finn as a stormtrooper in the first trailer, right? Then why does he have a blue lightsaber in the latest trailer? Is that blue lightsaber Luke’s lightsaber that he lost in “The Empire Strikes Back,” as some have speculated? Who knows. All we know is that the trailers for this film have done a great job of peaking our interest without giving too much away. They should serve as an example for all future movie trailers. This is how its done, movie studios. Take note! CAMEOS BY JAMES BOND AND M? The brilliantly funny Simon Pegg set the Internet ablaze this summer when he let it slip that Daniel Craig might be making a cameo as a storm trooper in “The Force Awakens.” Now, we realize that Pegg could very well have been playing a prank on the press with this statement, but that doesn’t mean we can’t still be excited about the prospect of Craig randomly popping up in the movie. Our excitement only grows as we remember that earlier last year there were rumors that Judi Dench might appear in the movie as Mon Mothma, the former leader of the rebellion. This rumor is almost certainly false, but we just can’t help but dream about a scene in which Craig’s star trooper confronts Dench’s Mon Mothma. If one of them made a veiled double 007 reference and then they both turned and winked at the camera, we think our movie nerd brains would explode. A HEARTBREAKING DEATH? SAY IT AIN’T SO, J.J.
Poor Rey. We don’t even know why she’s crying, but we just want to give her a hug. Clearly, she’s crying over something, or more likely, someone. Yep, it looks like this movie is going to hit us right in the feels just like its predecessors did. But the frightening question remains: who is she crying over? Unsurprisingly, the Internet is full of speculation about who could die in this movie, from Han to Chewie to Luke. 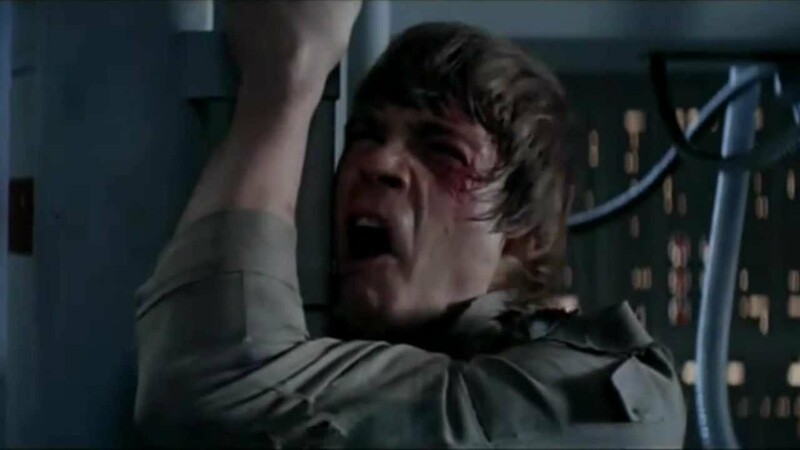 But the most heartbreaking scenario we’ve come across is the possibility of an evil Luke killing Han. That one really gets us down. Fortunately, it’s not very likely that the filmmakers would have the guts to go forward with such a twisted and controversial plot twist. People love these classic characters too much for them to have one kill off another. If they did, they’d probably have a full scale, Comic-Con sized riot on their hands. And no one wants that. Ah, Jar Jar Binks. He’s everyone’s favorite part of the prequels, right guys? Whoa whoa whoa! Take it easy. We were only joking. We understand that no one likes this abomination of a character, who somehow once shared a screen with the likes of Liam Neeson. So, in a way, wouldn’t it kind of be appropriate if he showed up in the new movie as one of the bad guys? Now, we know what you’re thinking. You don’t want him anywhere near the new trilogy. But bear with us. What if he just showed up in one scene and was killed off right away in an incredibly satisfying manner? Picture this: Jar Jar walks into the Mos Eisley Cantina and is immediately gunned down by Han Solo, who then turns to the camera and says, “I shot first.” Incredibly satisfying, right? In this one scene they could both rectify one of the worst prequel mistakes and resolve a debate that has been raging for over thirty years. Two birds, one stone. We know this is incredibly unlikely, but we can dream can’t we? In case you haven’t seen it yet, you should check out reddit user, Lumpawarroo’s hilariously in-depth fan theory about Jar Jar being a Sith Lord. The Internet was made for this type of stuff. ARE YOU EXCITED FOR STAR WARS: THE FORCE AWAKENS? WHAT ARE SOME OF YOUR FAVORITE FAN THEORIES? LET US KNOW IN THE COMMENTS BELOW!